A group of caterpillars of this species may often be found on the trunk of food tree at dusk or dawn. At dusk the caterpillars move up the trunk to feed nocturnally on the leaves of the tree, moving back down to hide in the undergrowth around the tree at dawn. 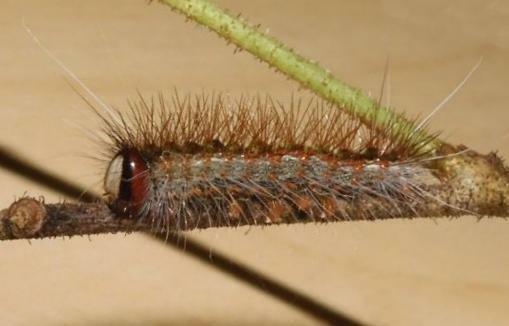 These caterpillars are dark grey and hairy. They have orange legs and orange spots along the sides. They also have two long prominent white hairs which stick out diagonally forward, one on each side of the thorax. Tick Bush ( Kunzea ). The caterpillars grow to a length of about 4 cms. They are gregarious, and occasionally may be seen in procession, each following the silken thread left by the one in front. 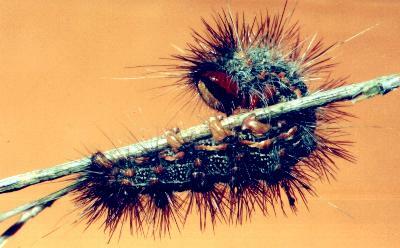 When mature, the caterpillars drop from their tree, and pupate in brown cocoons in the leaf itter. 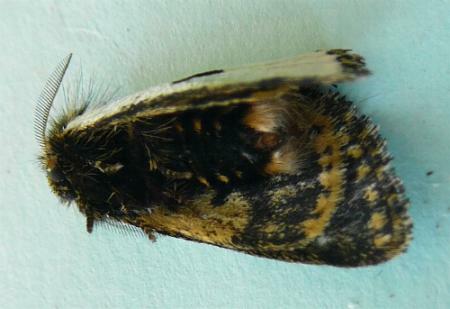 In Melbourne, caterpillars that pupated in February emerged as moths four weeks later. The adult sexes look different. 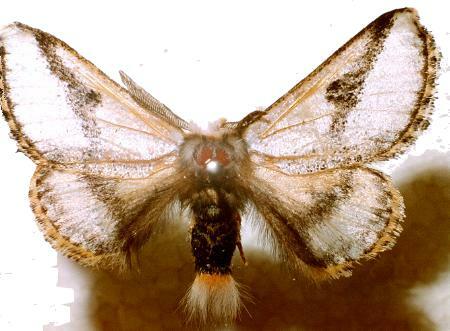 The adult female has forewings that are silvery white, edged in orange and black, each with a large black spot marking the middle. 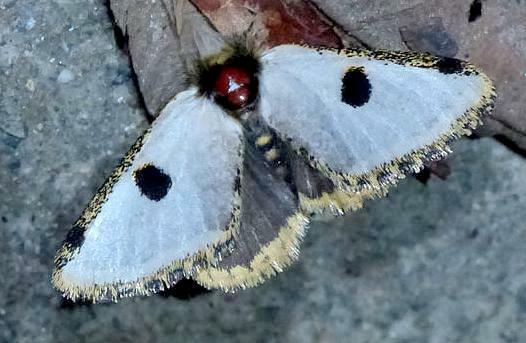 The hind wings are brown with a yellow border. 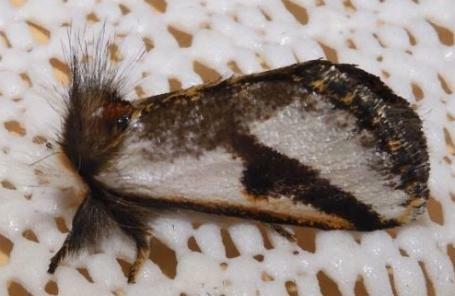 The abdomen ends in a beige hairy tuft. The wingspan is about 3 cms. 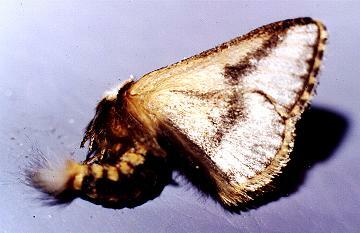 The male is similar, but also has a dark brown diagonal stripe across each forewing. Both have a yellow tuft of hairs on their tails. When upset, the adults are inclined to feign a death posture, lying on their side with wings held high and the abdomen curved under. 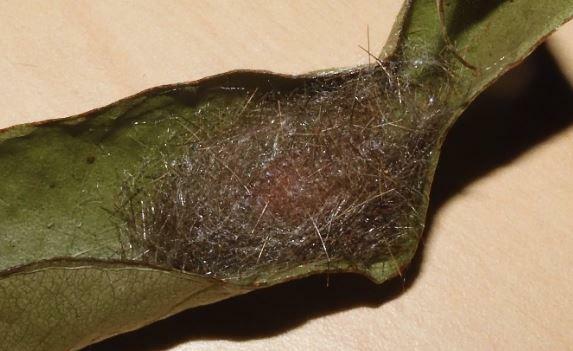 The eggs are laid on a leaf of a foodplant, and covered by the female with hairs from her body. 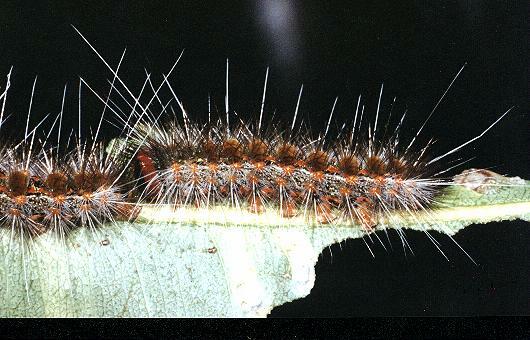 The caterpillars of this species are difficult to distinguish from those of Epicoma tristis. 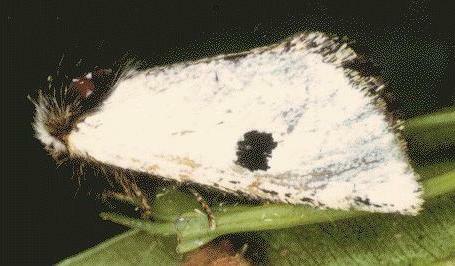 However on rearing them through to the imago, the adult moths are easily distinguished. Melbourne University Press, 1990, pl. 17.17. New South Wales University Press, Sydney 1992, p. 88. Entomological Society of Victoria, 2009, pp. 8-11. LeapFrogOz, Kuranda, 2015, p. 178. Volume 4 (1860), pp. 164-165, No. 22. CSIRO Publishing, 2007, p. 175.